One of the strangest aspects of the life of a chemist is to constantly be working with something we can (almost) never see as a unit: a molecule. In fact, a considerable part of our job is to draw conclusions from data obtained indirectly in order to deduce the structure of the molecules that we study! Over time, it was therefore necessary to develop ways to represent molecular structures and thus build a collectively accepted and understood image for the compounds we encounter. A molecule is, by definition, a set of two or more atoms held together by what is called chemical bonds. A bond is in fact a pair of electrons shared between two atoms, which keeps them close to each other. Without going into detail, one basic method of representation is therefore to indicate each of the atoms along with the electrons they share. To be stable, each atom must typically be surrounded by eight electrons, represented by dots, except for hydrogen, which only requires two electrons. Electrons always come in pairs. We call this representation the Lewis model (Figure 1). Figure 1. 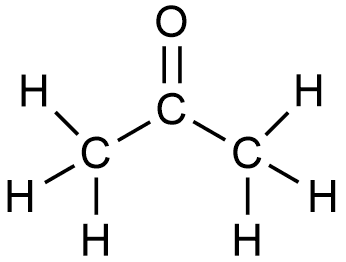 Lewis structure of methanol. This representation, however, is highly cumbersome, and is almost impossible to effectively use for larger molecules. Consequently, chemists have resorted to various simplifications to increase the flexibility of the representation of organic molecules, which often have dozens of atoms. The first simplification is to replace shared electronic pairs by a straight line representing a chemical bond. If several pairs of electrons are shared, the line is doubled or tripled. Pairs of free electrons, such as those of oxygen, are omitted. (Figure 2). Figure 2. Developed structure of acetone, where electronic pairs are replaced by bonds represented as straight lines. In organic chemistry, an overwhelming majority of the atoms that we represent are hydrogens and carbons. The simplification therefore continued to avoid having indicating them again and again. The carbons are therefore not shown, and by convention, a juction between chemical bonds, or a blank line tip, is automatically considered to be acarbon. Other atoms, called heteroatoms (other than carbon, C, and hydrogen, H) are still referred to by their chemical symbol (Figure 3). Figure 3. 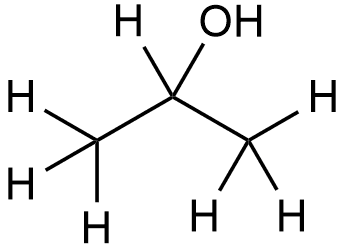 Developed structure of isopropanol, where carbons have been omitted and are, by convention, situated at the junction of chemical bonds. Hydrogen, finally, is omitted in molecular representations when it is bonded to a carbon. 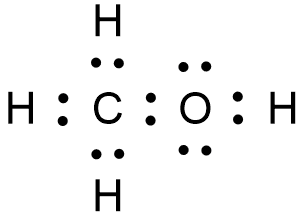 If we keep in mind that carbon must always have a total of four chemical bonds to be stable, missing bonds are implicitly filled with hydrogen atoms. Carbons showing three visible bonds include one hydrogen, whereas if the carbon has only one visible link, it rather bears 3 hydrogens. Figure 4 shows a complex molecule shown in this simplified manner, which is most commonly used by organic chemists daily. Figure 4. To the left, the developed structure of α-terpineol, with all atoms represented. To the right, the same molecule in its condensed form, as commonly used in organic chemistry. Junctions and tips are carbon atoms, and these are conventionnally "filled" with up to 4 links with hydrogens. In 2013, a team successfully "saw" molecules using a technique of atomic microscopy: a carbon monoxide molecule interacts with the molecule previously deposited on a silver surface, and its oscillation is measured and converted to an image (Figure 5). Note that this is again an indirect representation of the molecule, and not an image obtained by a photographic method: it is rather a translation of the vibrations generated on the carbon monoxide molecule. But as the researchers themselves point out, the similarity between the picture and the molecular schemes is striking. In short, our representations, although simplified, reflect quite well the chemical reality as we currently understand it. Figure 5. Molecular "pictures" obtained by atomic microscopy. Work of D. G. de Oteyza et al. 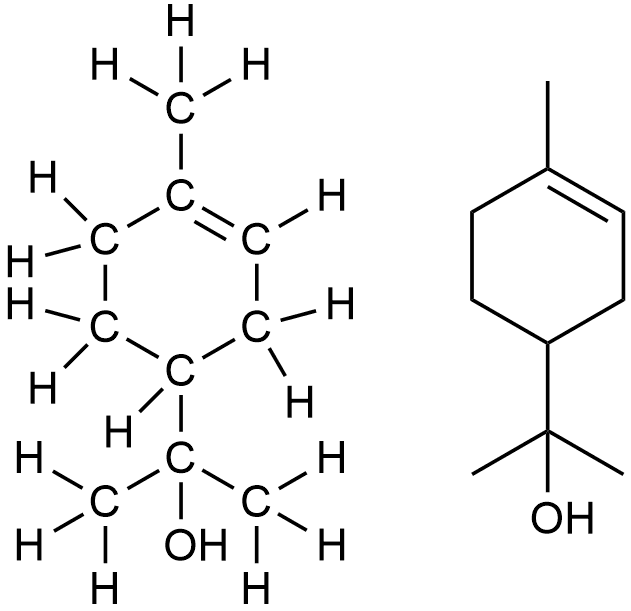 With this information, you should decipher more easily the structure of molecules represented in our blogposts and in most organic chemistry texts.